Lucky the 50 design influentials who nabbed an invitation to the recent cocktail buffet at the home of design laureate Lauren Rottet. With two of the nation's leading interior designers and a stellar architect as guests of honor, it was a heady night for the creative crowd. 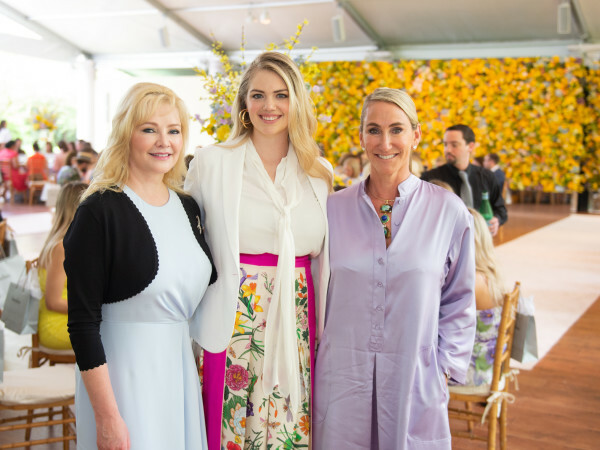 Mark Hampton president Alexa Hampton and San Francisco-based designer Jay Jeffers along with architect Michael G. Imber were in town as keynote speakers at the Houston Design Center Spring Market. All three brought copies of their most recent books and by night's end 80 copies had been sold. Not to be missed was the A Fare Extraordinaire buffet setting, almost as glamorous and certainly as delicious as the yummy design books. It was a quick hosting job for Rottet, who had flown in from Palm Springs for the three-hour party and then headed right back west where she had rented Twin Palms, Frank Sinatra's mod estate, for her sister's 60th birthday celebration. The evening presented a rare opportunity for design devotees to get a look-see at the 1920s Southern Colonial house decorated with an eclectic mix of modern furnishings and fine art. Getting up-close-and-personal with the design luminaries were artist Rusty Arena, interior designer Anita Webber-Smith, Houston Design Center owners Sheri and Grant Roane, Heritage Texas Properties CEO Robin Mueck, designer Laura Umansky and husband Michael, Houston Arts Alliance CEO Jonathan Glus, Teri Pugh, Holly Moore, Amy McAnally and Sarah Eilers.